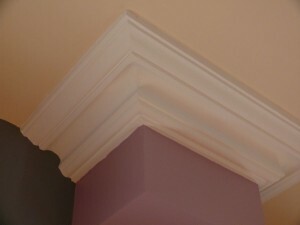 This 9″ cornice comes down 4″ and out 7″. It’s suitable for a ceiling height of 9′ to 12′. The 7″ cornice comes down 3″ and out 5″. Suitable for a ceiling from 8′ 6″ to 9’6″.